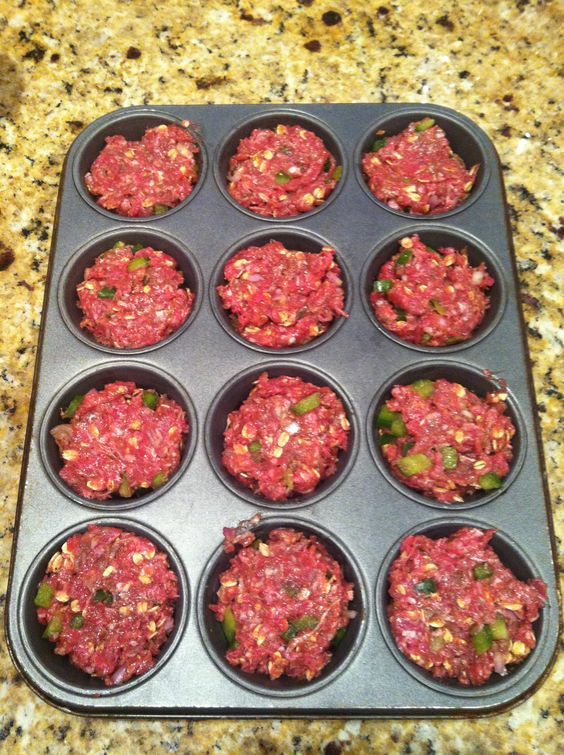 Put ground beef into a big bowl. Put onion and celery into a food processor. Cut the bell pepper in half, rip out the seeds and throw them into your garbage bowl. Cut the pepper into a few pieces and add to the food processor. Pulse the processor blades to finely chop the vegetables into very small pieces then add them to the meat bowl. Add egg, beaten with milk, bread crumbs and grill seasoning to the bowl. Next, mix together the smoky barbecue sauce, the salsa and the Worcestershire sauce. Pour half the sauce mixture into the bowl with the meatloaf mix. Mix the meatloaf together with your hands. Wash up. 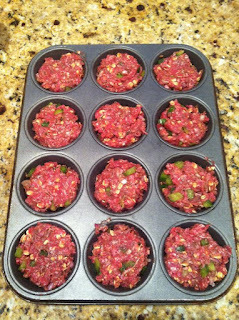 Brush a 12-muffin tin (1/2-cup each) with vegetable oil or extra-virgin olive oil. Use an ice cream scoop to help you fill meat into a each tin. Top each meat loaf with a spoonful of extra sauce. Bake about 20 minutes.